What does it mean to Live Like Bella? 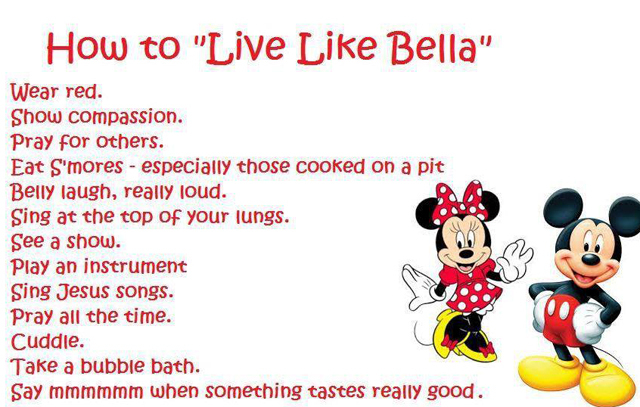 Live Like Bella means to eat something and enjoy it, savor it, go play with gusto, even the simple things. Do them and enjoy them. Learn something new, get out of your comfort zone and enjoy life. I have never met Bella. I knew her only through her Facebook page that her friends and family put together to help raise awareness about childhood cancer and for support through prayer for sweet little Bella. Even though I never met her in person, I feel like I know her. This is because she touched the lives of 10’s of thousands of people around the world. These are some of the things I knew about Bella and this would make me a Bella Believer. Most of all when I think of Bella, I think of faith through the eyes of a child. She showed more faith and grace than many adults that are completely healthy. This was a post that brought tears to my eyes for a few reasons. “‘When he had received the drink, Jesus said, ‘It is finished.’ With that, he bowed his head and gave up his spirit.’ Bella has now joined Jesus in heaven. She went peacefully, surrounded by love, right after our beloved Father Craig finished praying. Please pray for us now for the strength and peace to continue to #LIVELIKEBELLA.” This post that she is now with Jesus was sad in the way that her family won’t get to see her on this earth, but they will in Heaven. Tears of joy comes because I know that she is healthy and without pain. She is with the Lord where the best place would be. Supporters of Bella began to “Live Llke Bella,” a motto for pursuing everything that life has to offer. the Miami Police made me want to live in Miami. They reached out to Bella and her family. She was their chief and they raised money and awareness for childhood cancer. They still do this. 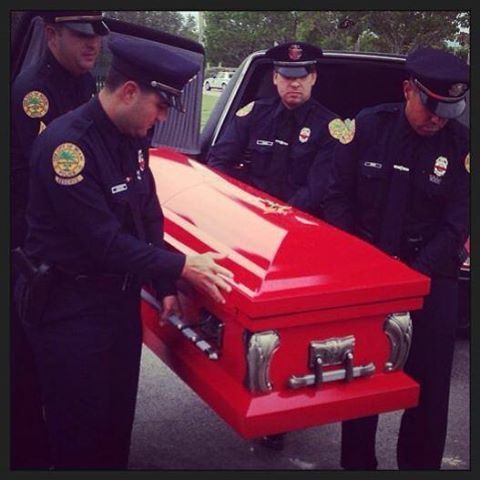 It brings tears to my eyes to see them escorting their chief in a tiny red coffin. Bella has a way of make me look at things differently. I may have health problems, but I have the Lord and there are so many far more worse off than I am. Bella NEVER EVER GAVE UP (NEGU). I recently lost someone close to me and I have chosen to remember the good things about Frankie and all those that I love. Life is too short to let anger and bitterness take control. Maybe because of my faith in Christ, I look at things differently. I don’t know. But I do know that I want to Live Like Bella and not focus on the me stuff. Even on my worst days I can thank and praise the Lord. Thank you Bella for being such a positive example of faith and love. Thank you Bella’s family for sharing Bella with us and allowing us into your life and into hers. If you would like to watch a wonderfully put together video about Bella, check this out. This is what Bella’s Mom Shannah read at Bella’s Funeral- Her love for Jesus and compassion for others always reminded me of Mother Theresa.